Camel Milk Health Benefits - Freeze Dry Camel Milk - Sahara Dairy Co.
Camel milk has been consumed in India for thousands of years. These ancient civilizations depended upon camel milk health benefits to survive. Since the beginning of time, camel milk provided the desert communities a staple food and vital source of nutrients to face and survive the harsh climate and living conditions in the desert. In fact, the Bedouins, or nomadic Arabs of the desert, refer to camels as the “Ata Allah” or the gift from God. Camel’s Milk is the world’s first and most powerful super food. 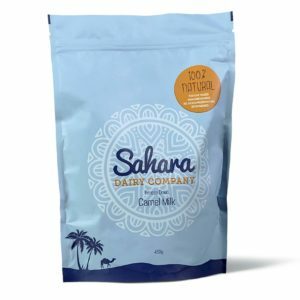 Unlike the camel farmers in the United States, Sahara Dairy Co.’s camels are free roam and eat a well-balanced diet of more than 50 different plants and naturally medicinal herbs found only in India. Our camel milk health benefits are superior in the abundance of vitamins, minerals, peptides and nano-antibodies which optimize and balance the immune system. Furthermore, camel milk is non-allergenic; it does not contain beta casein or lactoglobulin, making it the perfect choice for those who are lactose intolerant. Aside from having all of those amazing natural vitamins and minerals, camel milk contains 10% DV protein, 11% DV potassium, 15% DV phosphorus, 30% DV calcium and 70% DV vitamin B1. Recent scientific studies have shown countless camel milk health benefits over cow milk, which range from benefiting diabetic patients to positively affecting children with autism and improving the immune system – among many others. Camel milk also offers substantially higher vitamin and mineral content than cow’s milk. 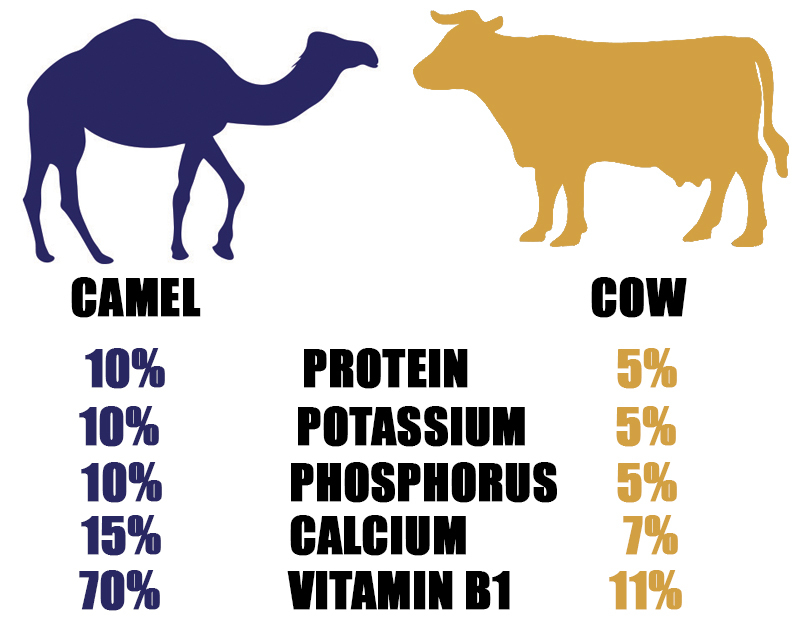 Camel milk has 25% more calcium, 5x more iron and 3x more vitamin C than cow’s milk. Our freeze dried camel milk can be used in a variety of ways that never compromise the quality of the taste or nutrients. Simply mix our camel milk powder with water for fresh milk. Add a scoop into your morning shake as an organic, healthier protein powder. Mix it with your coffee for a healthy, dairy-free coffee creamer alternative. Camel milk can also be used to replace cow’s milk in all recipes. Our versatile freeze dried superfood should become a staple in your pantry!